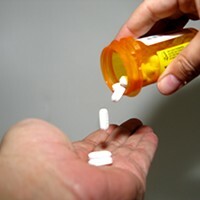 Starting Jan. 1, the pharmaceutical industry has agreed to a voluntary moratorium on the kind of branded goodies — Viagra pens, Zoloft soap dispensers, Lipitor mugs — that were meant to foster good will and, some would say, encourage doctors to prescribe more of the drugs. You may recall our story on this a while back, which focused more on the free food that drug companies lavish on doctors and their staff, and a bit on free drug samples. The NYT story notes that while the drug industry's new guidelines yank the pens and mugs and such, they "still permit drug makers to underwrite free lunches for doctors and their staffs or to sponsor dinners for doctors at restaurants, as long as the meals are accompanied by educational presentations." Whew, that's a relief. It's hungry out there.